In order to improve the post-war housing shortage, blocks of prefabs were built all over the country. On St. Helier, part of the open space was used on the area which had previously been allotments. They were intended to be a stop-gap solution, lasting only a few years, but their residents enjoyed them and on St. Helier they actually remained there for over 20 years. This page was added by Cheryl Bailey on 13/08/2010. I remember well the prefabs built just across from Winchcombe rd and at the side of the woods that ran up Middleton rd, before they built them some German prisoners had a camp there doing some kind of work, we use to see them on the way home from school. One of our friends Violet Shadbolt nee Stewart got a prefab what a change they were all mod con even had a fridge which no one had in those days and a stainless steel sink, kitchen cupboards, it was like something out of an American film, even had a little freezer at the top of the fridge, and we would stop there on the way home from school and Vi would give us an ice cube sometimes made with orange juice, that was the first time we ever had an ice lolly magic moments you never forget. Has anyone got Pic's of this camp during the war also were there Air Raid Shelters in Rose Hill Park? If not what was Rose Hill Park used for during WW2? Hi Phillip, As far as I remember there were no air raid shelters at Rose hill park - it just remained a park. Prior to the war it had gates which used to be closed at a certain time, until they were taken down for the metal. I was brought up in a prefab in Tweeddale Green, off Tweeddale Road. My memory is of a wonderfully mixed community – as a child you don’t register these things, but we had a range of nationalities and backgrounds: a Polish wartime pilot to one side, an Egyptian (don't know what he did) to another, a middleclass English civil servant across the way. Anyone else remember these days? Linda Byne. I remember the air raid shelters you speak of as a ladies n gents in the fifties. Ah, Alan Dibble! Yes, he lived in the 'electric' prefabs on the other side of Middleton Road. Ours were the 'gas' prefabs. The woods in between seemed pretty extensive to a young kid (cowboys & indians territory), but I suppose they weren't really very thick at all. I use to live in prefab number 12 Robertsbridge Green and attended Green Lane school. I lived there from 1948-1958. One of the other letter writers mentions Terry Heart, I can remember him because we were little devils when together, getting in the builders cement and striping my parents little apple tree. I used to live in the prefabs at 8 Robertsbridge Green until we were relocated to Abbotsbury Rd in Morden when they were demolished. I went to Holy Family Junior School and then on to Glastonbury Boys. It was a great place to grow up with great people. I was born in St Helier Hospital and still live in Surrey. I am still friends with 3 people who grew up on the estate and have met one or 2 others on my travels. My mum and dad lived in a prefab. I was only about 4 years old. Their name was Ramsey. I went to Tweeddale school from 5 years old in1950. I loved it, lots to do for kids and safe in that area just play in the fields or woods. Ah, yes, the prefabs. I too was born in St. Helier Hospital to the sound of German bombs! (1943 that was) I used to live in Muchelney Road and we did our shopping in Rose Hill. I used to go out with a girl in the prefabs I think her name was Rita, (age is wearing away names from the past unfortunately) She used to live with her mum in a lovely prefab with nice gardens and inside was wonderful. I used to use the running track in between them and the hospital anyone remember? Wow - was just thinking of the past this morning and just wondered if there were any websites about the prefabs!! I lived in Green Wrythe Gardens (no.6)which was off Green Wrythe Lane just opposite the school. I went there and then went to Glastonbury Road when I was 13 to do the commercial subjects. I have often browsed on Google Earth and gone up to the Circle where I used to go and get fish and chips, pie,mash and liquor. Lived next to the Jays on one side and the Cunninghams on the other. My mum died in St.Heliers Hospital in 1949 when I was 8. Hello Maureen, yeah my sister Janice went to gwl girls school, in a nutshell mo, she got married moved to Eastbourne, had two girls, got divorced, and sadly she died in 1986 aged 36, she was a lovely mum, we all miss her, but good memories. A couple of her school friends were Margaret Burcombe, Georgina Pemberton, and a tall slim girl named Sue I can't remember her surname. Hi Les - how sad to lose your sister at such a young age - the name Furnell does seem familiar. At 73 I am a little forgetful although I still have a lot of my memories of those school days. Seeing the new photo of the Pie and Mash shop has started me off on another tack altogether too! The other girls don't seem too familiar - when I was 13 I moved to Glastonbury Road school so missed out on a couple of years in gwl girls. Thanks for that Les. Just listen to your message Patricia - were you there in my years? 1948 - 1956/7? I was in prefab no.6 in Green Wrythe Gardens and like you, I absolutely loved them. 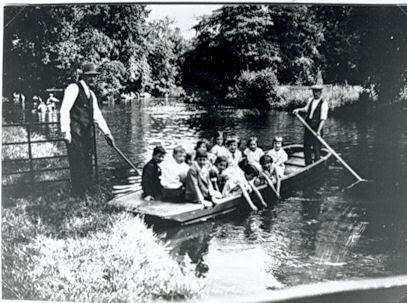 I have some great memories of our times on the green and it was so safe, rarely was there a car. 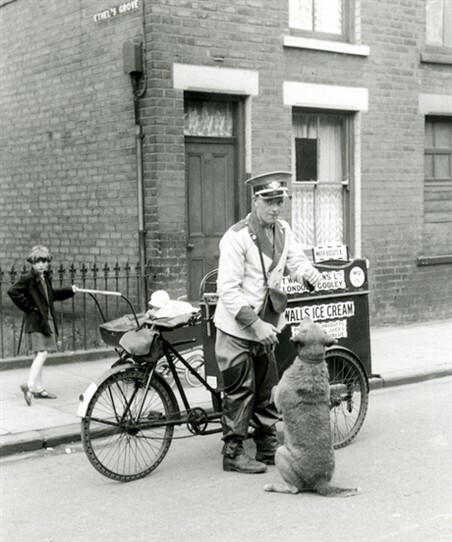 Leos used to stop and we would all rush in for our money to buy the ice lollies. It was great playing in the woods too. Would love to be in contact with others from there. I am in New Zealand now and living in a huge retirement complex which is just the opposite to the prefabs - would be called very 'posh' in our days as kids on the estate! Lovely to read all these comments, I too have very fond memories of our time in the prefabs. I was born in 7, Middleton Gardens the name is Knowles, Terry Knowles. On a Saturday my mum and dad would chop wood and bundle it, I sold it around nearby streets and my big brother Harry copped the money, I'm not bitter thou!! My Grandparents were Doris and Fred, uncles were Colin and Dougie, they lived at no. 15. Glynis lived behind them. A lady lived along the row and she sold sweets in her house. When we visited Nan and Grandad we would go along there for sweets. She had them by the back door. We thought it was lovely having a sweet shop in your house. I lived at no.35 Tweeddale Green, born at St Helier Hospital 1955, went to school at Tweeddale Road. I am one of 7 children and have fond memories of the prefab. My dad Ted was a milkman. Only remember someone called Carol who used to eat chalk? A little old, well dressed man who always smelt of lavender lived opposite. 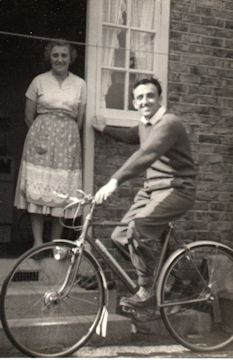 My older sister Christine married Roy Edwards whilst we lived at the prefab. My sister Susan and I enjoyed playing on the green in the centre of the prefabs... many fond memories . We moved into one of the prefabs on Tweeddale Green when I was five, in 1963. I lived there until they were demolished in 1969, when we moved to Faversham Road at the Morden end of the estate, backing onto Morden recreation ground. I went to Tweeddale School, just at the bottom of the road, until I left the juniors and went to Greenshaw. This was the same time we moved to Faversham Road. Tweedale Green was a sort of pedestrianised close. There was an inlet for cars at each end, one from Robertsbridge Road and one from Tweeddale Road, but most of the prefabs were accessed from paths. There was a big green in the middle. I don't remember much about the people. I had a mate called Colin who also lived on Tweeddale Green. I also played with a boy called John Gilman. A good friend was Jimmy Elliot who, I think, lived on Middleton Road, down past The Circle. Next door lived Mrs McLaren. I remember her husband died, and he lay "in state" for a while in her prefab. First time I'd ever seen a dead person. I remember riding my bike along the mud path through the woods lining Middleton Road. My Dad used to cycle to Southwark every day, to work in the council offices there. I used to walk up to the corner of Robertsbridge Road and Middleton Road and look out for him coming home. We were one of the last families to move out of the prefabs. A lot of them had already been pulled down by the time we left. I remember wandering around some of the abandoned and demolished ones with mates in the evenings. It was dark, so it must have been winter. I was only nine or ten! The prefab was great. I remember it being very light and airy. We had a big garden (or it seemed that way to me). It went all the way round the prefab. My parents grew lots of fruit; gooseberries and currants. I had a little canvas play-tent and remember sleeping out in it one night. Our kitchen was red. The bedrooms were very cold. We had a funny built-in coal stove in the living room with two doors with mica windows. Looking back, the prefabs were very cleverly built. The "central service core" was a triumph of good design, containing the back boiler (heated by the stove), hot water tank and all the plumbing. The same design today, built with modern materials and insulation standards, would make a fantastic dwelling. My Mum left when I was seven or eight, and my Dad brought me up. Looking back, it must have been hard for him, finding a way to look after me while he was working full-time. I remember going to Garry Crowley's house after school on Robertsbridge Road. His Mum gave me tea and Dad picked me up after he got back from work. Garry's sister was nearly grown up. She worked in the hairdressers at Rose Hill (it had a French name I think). His parents were called Doreen and Jim. Garry and I probably wouldn't have become good mates naturally, if it hadn't been for me going to his house, but we had some fun times. 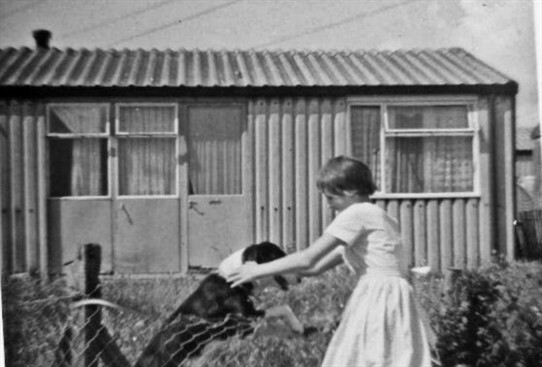 I am co-writing a social history of prefabs for English Heritage. I'm particularly interested in hearing about prefab gardens - what did people grow? How did this change during the decades? And also if anyone would like to tell me about why you loved your prefab so much and what was it that made it special for you, then that would be great. If you also have any nice photographs you wouldn't mind appearing in the book to go alongside your memories then I would be very glad to scan them and return them to you. I believe we lived at 12 Green Wrythe Gardens. My parents were Benjamin Edward Sibun my mum was Daisy Queenie & my brother was Peter Edward Everton. We lived behind the Cumminghans. We had budgies, chickens, cat, duck called Belinda & an Old English Sheepdog cross called Bruce. Very Nice memories.